Lowrance Elite 9 Ti has an average rating of 5 out of 5 based on 2 user reviews. When it comes to fish finders, you generally run across a feast or famine situation. Either the product is much cheaper than you would have expected—and its questionable quality shows why—or it is fairly expensive but generally works as advertised. There are a select few instances when fish finders actually work better than advertised, and they are usually at the highest end of the price spectrum. The Lowrance Elite 9 Ti breaks this mold in a couple ways—not all of them good—but is still a quality product at its price point. Of course, to understand what makes the product good or bad, you need to have at least a baseline idea of what the product should do in the first place. The first step is identifying how robust of a fish finder you need. This is generally broken down into 3 main categories: standalone, combination, and networked. Standalone fish finders are the most basic and often the cheapest. They do little more than find the fish, but are often the best at it—at least the better ones are. Combinations are fish finders and chart plotters. These can often be a bit dicey in terms of quality and will regularly do both jobs okay without being great at either. Networks are the most expansive—in terms of features—and expensive option but can provide a great deal more support. Whichever you need will often depend more on your intended use than anything else, and they can approximately be placed in categories according to the size of your boat and body of water in which you fish. Large boats that fish in the ocean would do best to find a reliable network fish finder that can provide better readings in deep waters and ensure that you do not get lost at sea. Likewise, standalone fish finders are more than adequate for small boats in local lakes with combinations serving the middle point between the two. The Elite 9 Ti is a combination fish finder, and as such, is best suited for medium sized boats fishing in medium sized bodies of water. Larger boats will find the Elite insufficient, while smaller boats may love the capability but have paid far more than their circumstances required. Still, the Elite 9 Ti is on the higher end of the Lawrence mid-tier combination line up, but it can feel lacking at moments. Granted, if you want perfection—or near it—you are going to have to spend over $1,000. So, for a couple hundred less, the Elite 9 Ti is generally adequate. Part of the issue arises from the fact that the sonar itself is great for where it is designed to be used—in small to medium-sized waters—but quickly loses its staying power, while some of its competitors are able to maintain a higher quality of readability under more challenging conditions. Of course, the Elite 9 Ti does somewhat make up for this by providing a wealth of maps on board—over 30,000 lakes and 1,000 miles of coastlines—as well as a virtual library you can download to an SD card for additional charting capabilities. Still, the impressive chart plotting capabilities does not really account for the on demand need that you will have in real time if you wade into waters a bit too deep. Keep in mind, this is not to suggest that the actual detection technologies are poor. The Elite 9 Ti uses the standard CHIRP as well as StructureScan HD and DownScan Imaging to provide a solid three-dimensional image. However, the StructureScan requires the TotalSacn transducer which is optional and will drive up the price. One feature that definitely stands a bit above the competition is the display; however, this should not be taken simply to mean “the screen.” In fact, at this price point, you should expect your combo unit to provide connectivity with other devices—namely, smart phones or tablets. The way the Elite 9 Ti shines in this regard is the ease with which it connects. Many other devices require a cumbersome synchronizing process that can be a bit hit or miss. However, the Elite 9 Ti syncs easily. Still, in regards to the screen specifically, the Elite 9 Ti is no slouch. It provides a 9”, high resolution, LED-backlit display. The only caveat is that when using the 4-way split screen feature, it can still get a bit crowded—which is where the easy external device connectivity comes in handy. Regardless, the mid-tier of any brand’s combo fish finder is going to have its ups and downs. Some of them come with amazing detection capabilities, but fall flat on the connectivity or display. Still others have issues with mounting—which can be frustrating to no end. 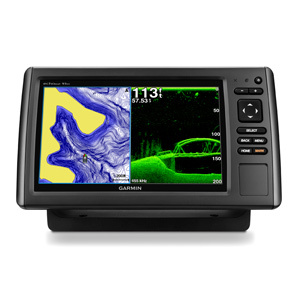 However, at this price range, the Elite 9 Ti is still one of the better models and easily competes with any Garmin, Humminbird, or Raymarine in the same class. You can get a great deal on Lowrance Elite 9 Ti here. This unit has it all: large 9inch display, multi-touch screen, structure scan (no need for separate transducers or modules), excellent pre-loaded maps that include even very small lakes, smooth screen transitions, no freezing. The user interface is the same as in the HDS units. I’m glad I bought this unit, I considered HDS but this was much cheaper. I HAVE THE 9 TI UNIT. I LIKE THE EASE OF MOVING AROUND ON THE UNIT . I STILL HAVE TROUBLE GETTING THE 100 PERCENT USE OF THE CHIRT PART ON THE UNIT . I AM NOT GETTING THE FISH ARCH, ON CHIRP THAT I WAS EXPECTING OUT OF THE UNIT. THE DOWN SCAN IS GREAT, JUST NOT THE CHIRP SONAR PART. I DID ALL THE SETTING I KNEW WHAT TO TRY . A LOT OF EXTRA MONEY SPENT ON CHRIP, NOT TO WORK. I ALSO HAVE THE TOTAL SCAN TRANDUCER.